Hmm, solid card to start the week. Blessings! 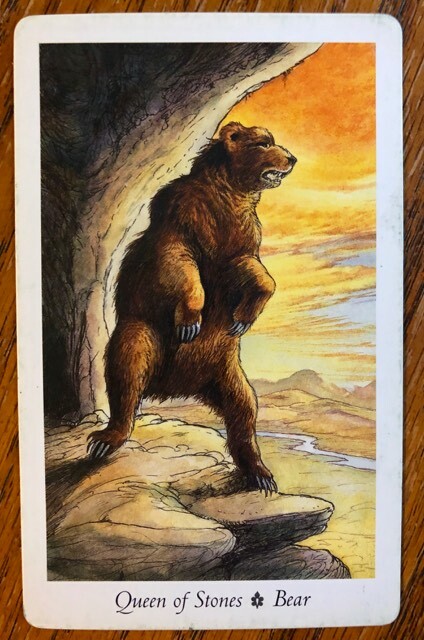 Meaning: The ancient ancestor of the modern bear, the cave bear hibernated in caves during the cold northern winter. Neanderthals buried their skulls here and even shared their caves during some periods. Often linked to Arthurian legend, the Bear remains a symbol of the power and protection of the land. Reading Points: Richness and plenty surround you. Your bounty and welcoming nature make you popular with all. Many depend on you, and your natural sensuality makes you powerful attractive to others. Pragmatism and generosity open doorways at every point. Tracks & Pathways: Power and generality, punctiliousness, a demanding individual, confidence, frankness, assurance, and property.